The Augusta Unitarian Fellowship was organized in July 1954 when 12 people signed the membership book. For the next six years the fellowship met in a variety of locations around Augusta. Upon purchase of a lot on Walton Way in November 1959, the building dedicated in 1960 was designed by Don Kelly, one of our charter members. Office space was added to the original building in 1975 using funds from the sale of the Aiken, SC congregation’s building when they disbanded. A new sanctuary was completed in 1985. Building on the fellowship’s activism in the Civil Rights movement and early establishment of a Social Action Committee, The Open Door Kindergarten, Augusta’s first inter-racial school, was opened in the church building in 1964. Our Social Justice Committee continues to be an important part of the church and its identity today. 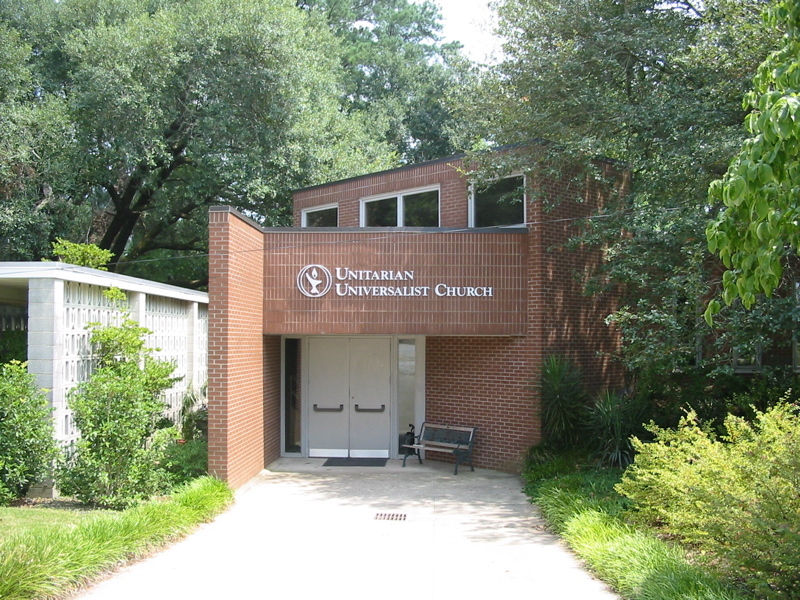 In 1967, the name of the congregation was changed to Unitarian Universalist Church of Augusta. This action reflected the convention of the time for congregations to change their name from “fellowship” to “church” as they grew into what we now call pastoral size. Our music program, which is such an important part of our services, took a great leap forward with the purchase of a grand piano in 1992 and the hiring of Joe Patchen as music director shortly thereafter. Between 1994 and 2002, we completed the Decisions for Growth, Journey Toward Wholeness, and Welcoming Congregation programs. The Welcoming Congregation Program is a volunteer program for Unitarian Universalist congregations that want to take intentional steps to become more welcoming and inclusive of people with marginalized sexual orientations and gender identities. First launched in 1990, the program grew out of an understanding that widespread prejudices and ignorance about lesbian, gay, bisexual, transgender, and queer (LGBTQ) people existed within Unitarian Universalism, which resulted in the exclusion of LGBTQ people from our congregations. Today, 66% of U.S. Unitarian Universalist (UU) congregations and 94% of Canadian UU congregations are recognized as Welcoming Congregations. Our church is a fairly unique haven for the liberal and progressive-minded, and is deeply loved by its congregation for being so. Members often use the metaphor of an “oasis” to describe the comforting role of the church. Yet the church sometimes also plays an important, spear-point role to champion justice and liberal causes – countering racial and ethnic prejudice, supporting LGBTQ pride and rights, welcoming pagans in our congregation, and being a public, progressive voice in the region. The UUCA is an active participant in the Progressive Religious Coalition and the Interfaith Fellowship of Augusta. Numerous members of the congregation are also Sierra Club members, and the church collaborates with the Sierra Club in fundraising events each year. The church also is a sponsor of Navigators USA Chapter 95 Augusta GA, a secular co-ed scouting organization for children ages 6 – 18. Its mission is to build community in America through scouting activities that teach leadership, conflict resolution and stewardship of the planet. The Unitarian Universalist Church of Augusta (UUCA) congregation is very diverse in terms of professions, income levels and ages. In the areas of philosophical bents and religious beliefs and practices, UUCA members identify with humanism, naturalistic theism or earth-centered spirituality, mysticism, pantheism, atheists, agnostics, or skeptics. Smaller yet vibrant groups within the congregation identify themselves as Pagans, Buddhists, or UU Christians. Traditionally our members have come from the area universities, the large medical industry in Augusta, and the Savannah nuclear power and research facilities. The UUCA church congregation also includes both Ft. Gordon civilian employees and soldiers. Our Children’s and Youth Religious Education program, along with our Adult Religious Education classes, offer varied curricula for faith development. We have monthly family potlucks and meetings of the ‘Limbo’ (Young Adult) Crowd. Our Worship Team plans the year-round Sunday services, including intergenerational worship for Fall Ingathering, Dia de los Muertos (Day of the Dead), and winter festivals of light. UUCA offers pastoral care through our full-time minister, the Rev. Dr. Gaye Ortiz, and the Pastoral Care Team. We hope you will take full advantage of the activities in the UUCA community; we welcome you and hope that as you nurture your soul, you help us to build a Beloved Community – and together, we can transform the world! When we speak of “worship,” we are referring to the shared religious life of our congregation: attending Sunday worship services, creating religious music, honoring life passages like marriage and death, and celebrating special holidays together. Our monthly religious themes invite us to find ways to put our faith into action beyond our walls. Together and individually we consider the many ways we can reach out and work together to build a more just, loving and sustainable world.